Find out what multiband compression is, get tips on how to choose different multiband compressors for different purposes – and learn some practical ways to use it in your mixing and mastering sessions. Compression. It’s one of the most used yet least understood audio shaping techniques. Though renowned for adding punch and providing the ‘glue’ that holds mixes together, compression (and especially over-compression!) can sometimes do more harm than good if not applied correctly. Multiband compression, though considerably more sophisticated than standard compression, carries the same double-edged sword: Used appropriately, it can perform sonic wonders, yet misused it can yield less than optimal results. Perhaps the easiest way to understand compression of any type is to think of it as an invisible mixing assistant, tasked with one, and only one job: Whenever a sound gets too loud, move its fader down (no, it doesn’t really move – we’re talking virtual here) to make it softer; that is, ‘compress’ the sound so that the loudest sections aren’t quite so loud compared to the softest sections. The result: the track sounds more even and stable overall. How loud is too loud? That’s determined by the threshold setting; whenever the signal exceeds the threshold you’ve set, attenuation occurs (that is, the ‘fader’ moves down). And how much attenuation is needed? That’s determined by the compression ratio. At a ratio of 2:1, if the input signal goes above the threshold by 2 dB, the compressor ‘fader’ will be yanked down so that the increase in output is just 1 dB; at a ratio of 3:1, the increase in output will be just 1 dB for every 3 dB of input above the threshold; and so on. In other words, the lower the threshold and the higher the ratio, the more compression will be applied. Finally, imagine that your invisible assistant has lightning-fast reflexes. So fast, that he or she can move that virtual fader in just milliseconds. You can specify an attack time – that is, how quickly you want your invisible assistant to move down the ‘fader’ once the signal gets too loud – and a release time, that is, how quickly you want the ‘fader’ returned to its original position after it’s been moved. All four of these main controls – threshold, ratio, attack, release – are provided by both standard compressors and multiband compressors. So what is the difference? Simple: Standard compressors affect the entire frequency spectrum of a signal, whereas multiband compressors affect only particular frequency areas of the signal. This is accomplished by routing the incoming audio signal into a number of ‘crossover’ filters which divide it into several frequency areas, allowing you to independently apply compression to each as desired. With a multiband compressor, you can alter the low frequencies while leaving the high frequencies untouched, or vice versa. Multiband compression is all about consistency. The idea is to have all the highs, mids, and lows in each instrument (or the overall mix) balanced and even. It’s a technique that avoids many of the problems inherent with standard compression, such as ‘pumping’ or ‘breathing’ artifacts, or the loss of high frequencies in compressed vocals. By selectively compressing specific frequency areas, you can shape a lead vocal in different ways as a singer goes through different registers during a song, or reduce the harsh upper-mids in a screaming guitar that the human ear is especially sensitive to – the so-called ‘hurt’ frequencies. Multiband compression is great for getting good articulation out of a fingered bass guitar track, since you can tighten up the lowest frequencies (thus reducing boom and woofiness) without affecting the mid- and high-midrange frequencies, which carry the attack of the sound. Because it is more inconspicuous and subtle than traditional compression, multiband compression can also be a powerful tool to use during mastering. It allows you improve bad mixes that feature a kick that is way too loud, or one with uneven peaky vocals. You can tame that hollow snare drum that jumps way above everything else without affecting the sound of the voice, or put over-excited hi-hats and dull vocals into relative unity. Remember that like any type of compression used during mastering, multiband compression should be applied with care when mastering a track. One good rule of thumb: Be sure to set the same (or at least a similar) ratio in all the bands being affected, or you will risk adding an imbalance to the sound. As we’ve seen, all multiband compressors utilize crossover filters so that compression can be applied only to the necessary frequency areas. Waves’ multiband compressors – C4, C6, and Linear Phase – also utilize phase-compensated crossovers that are designed to yield a flat frequency response (that is, no cut or boost) when set to nominal values. This is critical if you want to avoid coloration to the sound and other undesirable sonic artifacts such as pitch-shifting between bands as their gains move independently. Which multiband compressor you choose depends to some extent on how selective you want to get with the frequencies you’ll be compressing: the C4 compressor provides four frequency bands; the Linear Phase compressor provides five; and the C6 provides a total of six, including four fixed bands and two additional ‘floating’ bands with parametric width (‘Q’) control and sidechain input – an especially powerful function that allows the selected frequency band to respond to level changes in a signal other than the one being affected. Automating the sidechain input in order to duck a specific frequency range can calm a pesky component in a mix, or even make it disappear altogether. Whereas the C4 and C6 will suit a variety of mixing tasks, the Linear Phase Multiband Compressor is especially suited for mastering, adding features such as adaptive thresholds, automatic makeup gain, and finite response filters. 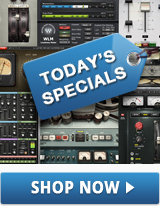 All of the three plugins mentioned above also offer expansion capabilities, which can restore some sense of dynamics to over-compressed material, in addition to limiting and compression. The bottom line is that multiband compressors can do something that standard compressors cannot: react differently to differing frequency content. They provide a precise means for selectively affecting only those parts of the audio signal that need compression, while leaving the rest of the sound untouched, which makes them extremely useful when you only want to affect a certain problem area in a vocal, an instrument or a full mix. Wonder how multiband compression is different from dynamic equalization, and how they are similar? 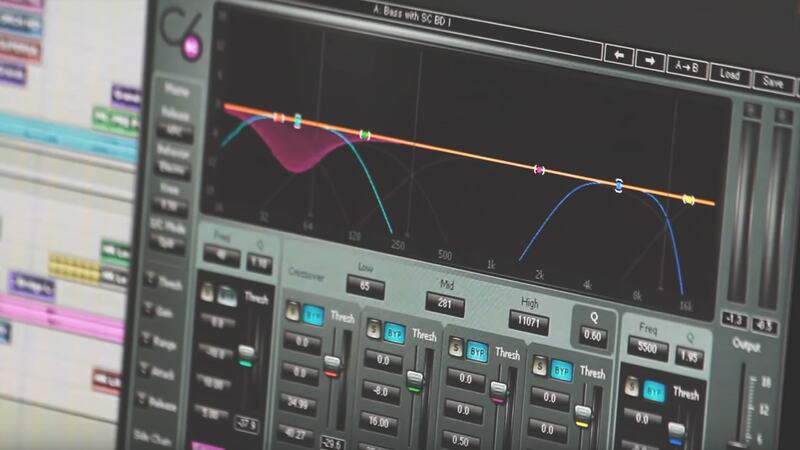 Learn more in our article about how and when to use dynamic EQ.